SUSAN L. CARPENTER is a mediator and trainer. She is thefounding director of the Program for Community Problem Solving inWashington, D.C. and a founding board member of the InternationalAssociation of Public Participation. She was the associate directorof ACCORD Associates, a nonprofit conflict management organizationin Boulder, Colorado for ten years. W.J.D. KENNEDY was the executive director of ACCORDAssociates for fourteen years. He has consulted with a wide varietyof private organizations and city, county, state, and federalagencies. Part 1: Public Controversies and Conflict Management. 1 Understanding Public Disputes: The Spiral of UnmanagedConflict. 2 Dealing with Conflict Productively: Alternatives and CaseExamples. 3 Developing an Effective Program of Conflict Management: TenPrinciples. 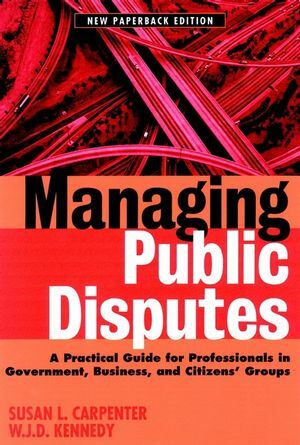 Part 2: A Step-By-Step Process for Managing PublicDisputes. 5 Designing a Strategy and Setting Up the Conflict ManagementProgram. 6 Adopting Procedures, Educating Parties, and DevelopingOptions. 7 Reaching and Carrying Out Agreements. Part 3: Ensuring the Success of Conflict Management. 8 Guidelines for Making the Program Work. 9 Paying Attention to Underlying Dynamics: Values, Trust,Power. 10 Handling the Human Side of the Process.